Have you ever wondered how professional renovators manage to find run-down properties in great suburbs and make a profit from renovating? It can feel daunting when you’re unsure of whether you’re buying in the right area, whether you can even find a property with profit potential or if you will have a buyer for your completed project. 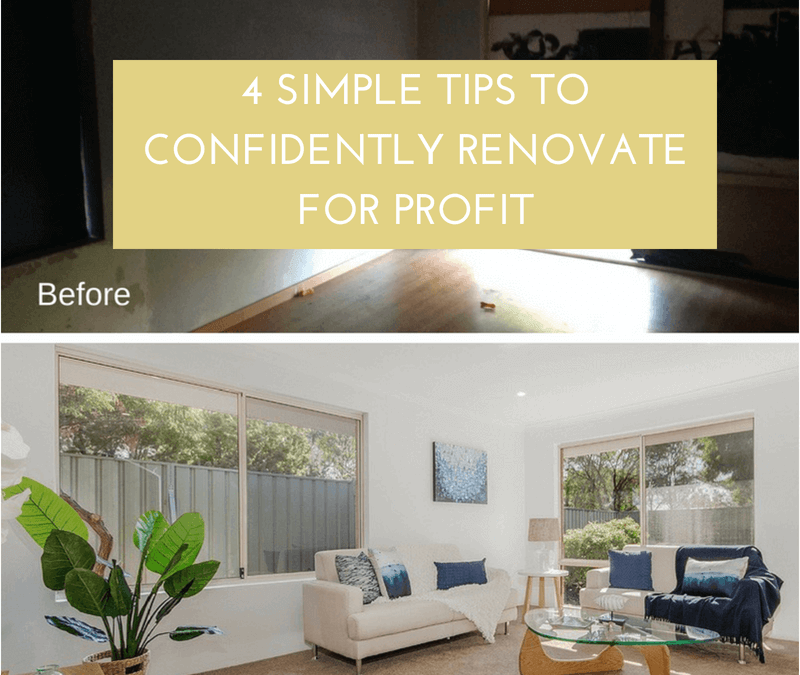 Here are 4 simple steps that I used on a recent renovation and which I hope will help you gain the confidence and clarity you need to embark on your own renovation project. It’s important to determine that there is not an oversupply of houses for sale, with too much stock on the market and no buyer urgency. You can find this out by talking to local real estate agents and by checking the data for your suburb at the back of this magazine. I found this ‘renovator’s delight’ in a coastal suburb where the supply vs demand scales were balanced equally. Many of the houses on the beach side of the main road were over twenty years old so I knew there would be buyer’s looking for my beautifully renovated end product in the more desirable part of the suburb. By presenting my completed renovation to the market in summer, using calm coastal colours, I was able to appeal to the senses of buyers who were looking to embrace the Aussie beach lifestyle. Tip #2 – Become best buddies with your local real estate agent! Local agents are your eyes and ears on the ground and are first to know about potential “cash cows” being listed for sale. Communicate clearly what kind of property you’re looking for and what you intend to do with it. By having an honest, respectful relationship with your local real estate agent you stand the best chance of being matched with your perfect property as soon as it becomes available. By employing this strategy, I was able to find out about this house being listed for sale BEFORE it was advertised on the property search engines. I knew that I could make a profit, as long as I could secure the property at my “walkaway” price. Given the condition of the property, there was a good chance that I would be able to achieve this. Know exactly who will be buying your renovated property BEFORE you even purchase it! You need to know who is looking in that suburb and understand what they want in a home. By making sure your renovation ticks all their boxes you will have the best chance of achieving a quick and profitable sale at the completion of your renovation. This house was in a strong community-minded family suburb and I knew that my end buyer would be a family with children. They would want separate living spaces and an open plan kitchen area for family gatherings. Having a parent’s zone with luxurious master suite and a large backyard for the children would also be valuable drawcards. By keeping my end buyer in mind at all times, I was able to achieve the goal of having a family fall in love with the property and desire it for themselves. How will buyers fall in love with your renovated property if they can’t see themselves living happily in it? An empty home is a soulless home and they just won’t feel that connection if it is empty. Making a profit is the aim of the game but the added bonus is how good you’ll feel knowing you’ve turned a neglected house into a beautiful family home once more. For more photos of this gorgeous renovation, you can check out my article here in Australian Property Investor magazine.